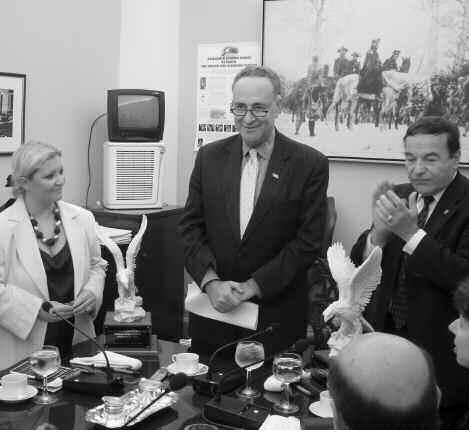 And yet a recent press release boasted, “DioGuardi Senate Campaign Gaining Momentum With PAC Support; California-based conservative PAC will air ads in key NY Markets,” and Guardian Angels founder Curtis Sliwa headlined a DioGuardi fundraiser. Is this a cynical and discriminatory ploy to taint Joe DioGuardi, and an entire nationality, with the criminal element that every ethnic group is entitled to? If only. The sad fact is that the Albanian mafia and DioGuardi’s’s KLA are inextricably intertwined. And thanks to him, the United States is now intertwined with them both. But the longer story of Joe DioGuardi is worse. Backing the KLA is simply insane. My contacts within the DEA are quite frankly terrified, but there’s not much they can say without risking their jobs. These guys [the KLA] have a network that’s active on the streets of this country. The Albanian mob is a scary operation. In fact, the Mafia relied on Albanian hit-men to carry out a lot of their contracts. They’re the worst elements of society that you can imagine, and now, according to my sources in drug enforcement, they are politically protected. It’s the same old story. Ten years ago we were arming and equipping the worst elements of the mujahideen in Afghanistan — drug traffickers, arms smugglers, anti-American terrorists. We later paid the price when the World Trade Center was bombed, and we learned that some of those responsible had been trained by us. Now we’re doing the same thing with the KLA, which is tied in with every known Middle and Far Eastern drug cartel. Interpol, Europol, and nearly every European intelligence and counter-narcotics agency has files open on drug syndicates that lead right to the KLA, and right to Albanian gangs in this country. In an undercover investigation into criminal gangs operating in north London Albanians who fought in the KLA during the bloody Balkans conflict against Serbia, now have established themselves as formidable figures in [London’s] underworld. Experienced users of guns and knives the Albanians are one of the most able assassins in London. The war in Kosovo fuelled the spread of the Albanian Mafia after numerous gangsters disguised as Kosovar ‘refugees’ found their way into European countries…. U.S. soldiers called upon to enforce a “peace” accord that turns Kosovo over to the KLA might be interested to know that they are risking their lives on behalf of a criminal syndicate that for years has pumped heroin into the U.S. and threatened the lives of American law enforcement officials…Unlike other ethnic criminal syndicates…the Albanian narco-mafia was willing to make war directly on U.S. law enforcement officials. One U.S. Attorney active in prosecuting “Balkan connection” gangsters learned that a contract had been taken out on his life by an ethnic Albanian defendant, as well as upon Assistant U.S. Attorney Alan M. Cohen and Drug Enforcement Administration agent Jack Delmore. She claims that UNMIK [UN Mission in Kosovo] and KFOR [NATO in Kosovo] officials and even some ICTY [International Criminal Tribunal for the former Yugoslavia] judges in the Hague tribunal are fearful for their lives if connected to the KLA crime investigations, and feel threatened by the so-called Albanian reach. In her book, Del Ponte says that those few and far between investigations of the terrorist KLA were the hardest during her appointment as the ICTY chief prosecutor, that her researchers were confronted by the clans, vendettas and political pressures, and that “policemen from Bern and Brussels and all the way to Bronx” are well aware about the insurmountable difficulties when it comes to the attempts to investigate Albanian organized crime. This should give Republicans some pause. DioGuardi reveals that his priorities aren’t ideological but tribal, and he flaunts them heavily. Similar sentiments were expressed by other Albanians when asked whom they were rooting for, McCain or Obama, with one replying, “Kosovars will love either candidate as long as they continue to love us.” There is your Albanian “pro-Americanism” in a nutshell. Highly conditional. Lest the McCain connection cause too much cognitive dissonance in conservative minds and hearts, remember that the KLA is impartial: “Kerry Campaign Financed by Terrorists;” indeed, the group is as bipartisan as its congressional supporters. During NATO’s assault on Serbia, DioGuardi was pictured burning a Yugoslav flag at a pro-KLA demonstration…DioGuardi’s noxious activism also extended to Macedonia. 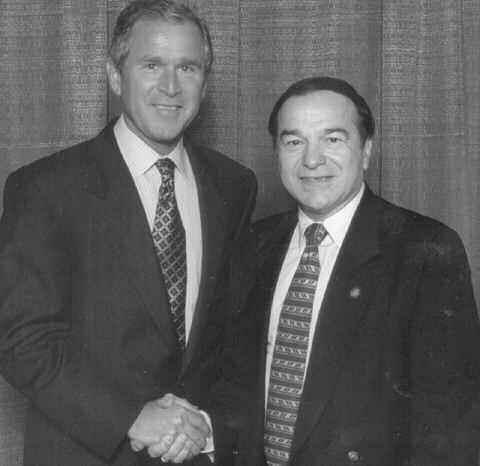 During that country’s September 2001 offensive against the NLA [KLA extension] insurgents in the Tetovo region, DioGuardi and his wife demanded that President Bush intervene on the insurgents’ behalf and warned that “massive human rights violations” are taking place. What the duo really demanded was American help in the dismemberment of Macedonia and the creation of another Kosovo-like enclave in the Tetovo region of Macedonia…The DioGuardis had the gall to release their report on September 12, 2001…. [The Albanians] became a potential threat to their former allies. And so in Kosovo, US troops cowered in the relative luxury of Camp Bondsteel, rather than chase down the gun-runners and guerrillas trying to cross the Macedonian border. In Macedonia, the new fear of the Albanians has caused the US to go along with all of their demands — lest they might perhaps open fire on NATO. This position was stated way back in March, in an article in London’s Guardian ( “Why NATO is ignoring Macedonia,” by Simon Tisdall, 22 March, 2001). The author maintained that the NLA had the upper hand — and knew it — because of the perceived American fear of casualties…Quite simply, they know no one is going to stop them…The Albanian-American lobbyist groups are both well-organized and well-funded, and they have the ear of influential lawmakers…Macedonia, unfortunately, does not have similar legislative influence in the US. Indeed, if anyone thought our alliance with the KLA and its criminal partners ended with Kosovo, note that as the drug-funded expansionist terror continues, we’re being dragged along for the ride. This is how the U.S. military came to be obstructing European investigators and protecting KLA heroin factories and even transporting their narcotics and weapons. In other words, when confronted with the potential threat to Americans of the KLA and its associations, DioGuardi deflects attention to Serbs and Greeks. So concerned is this Tea Party-endorsed candidate with American security that when someone raises a red flag, he wants Americans to dismiss the warning as an ethnic rivalry that’s trying to turn them against Albanians, a case of projection if ever there was one. So amid increasing Albanian criminality and terror recruitment, and amid the constant threat of Albanian violence (which, make no mistake, is what has been driving our pro-independence policy since 1999), “Republican” Joe DioGuardi wants to shift your focus to Serbs and Greeks who have never attacked us, nor been a threat to us, and are not expansionist societies. DioGuardi sees Belgrade, Skopje and Athens as the enemy, and anyone who has paid the slightest attention to American behavior in the region will discern that at some point, we began to as well. But it wasn’t Greeks and Serbs who were behind the Fort Dix plot that was interrupted in May 2007. Out of six co-conspirators, four were ethnic Albanians. The man who supplied the guns, Agron Abdullahu, had been a sniper in Kosovo and, despite being “rescued” by the US — entering through the makeshift refugee camp at Ft. Dix in 1999 — at work he would refer to bin Laden as “Uncle Benny”. While in jail in 2007 he etched “UCK” in his cell (Albanian for “KLA,” which prosecutors explained to reporters as “a paramilitary organization with a history of war crimes”). He also drew a gun pointing toward the letters “FBI.” It came out during the trial that the gang had been deciding between hitting Ft. Dix and firing on the White House. Ft. Dix was just the most high-profile Albanian-involved terror news in America. Skipping all the regional terrorism they’ve been engaging in in the Balkans — incidents too numerous to recount — KLA veterans have turned up in jihad theaters beyond the Balkans, as Damir Bajrami’s application at an al Qaeda camp in Afghanistan showed. “I have Kosovo Liberation Army combat experience against Serb and American forces. I need no further training. I recommend (suicide) operations against (amusement) parks like Disney,” USA Today quoted in 2001. In September of last year, Brooklyn-born Betim Kaziu was indicted for “conspiring to commit murder overseas and helping terrorists…[He] traveled abroad to try to join several terrorist groups….He also allegedly tried to travel to Afghanistan, Iraq and the Balkans to fight against U.S. armed forces.” (Indictment here.) In August 2009 four men, one of them a U.S. citizen, were arrested in Kosovo “for illegal possession of weapons and endangerment….police found two Kalashnikov rifles and five hand grenades….” And a month earlier we all heard about the North Carolina crew led by Daniel Patrick Boyd, which included two Albanians and meant to target the Marine base in Quantico and to wage terror abroad. In the foiled 2006 bomb plot against Montenegro’s parliament, the Austrian newspaper that broke the story — Kronen Zeitung – reported that the man who was to detonate two bombs in the building was an al Qaeda-connected Kosovo Albanian named Dodu Ljucaj. 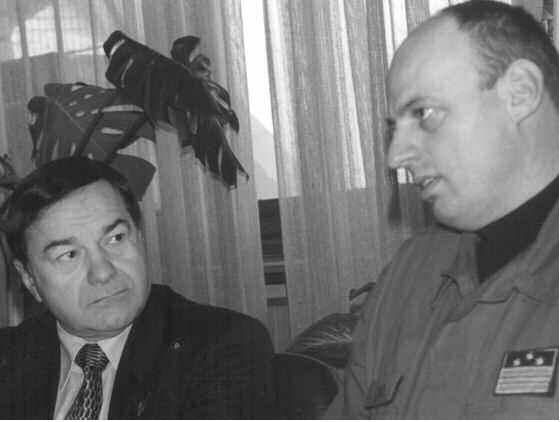 Following the Zeitung story was Mickey Bozinovich, proprietor of a Serbian news site, who learned that Ljucaj had been extra nervous upon arrest, as he’d just been “turned” by the CIA to be a mole in al Qaeda. And to cite just one of a multitude of such associations, it came out that an Albanian mafia boss named Princ Dobrsi (or Dobroshi) had been helping one of the jihadists arrested for the 2006 Oslo synagogue attack, to plan attacks against Prague. According to Gambill, the radicals were “linked to a wealthy Mafioso in Mitrovica” — a shock admission linking Islamic radicals and the Albanian mafia. More shocking, however, was the utter disinterest with which UN authorities greeted this apparent “smoking gun” case. While investigators elsewhere were racing furiously to track down anyone and everyone with foreknowledge of the 9/11 attacks, the CivPol [UN police] officer who identified the agitators, according to Gambill, “was frustrated that no one above him [in rank] was interested, and no one above him really pushed [for this investigation] — there was little said about it — and no follow-up. Until recently, an otherwise blacklisted “charity” was functioning freely in Kosovo, and an Albanian in a suicide vest was arrested last year in Kosovo. …In the somewhat intellectually perverse foreign policy salons of New York and Washington, the more ties a Balkan politician has to drug smuggling, human trafficking, and al-Qaeda, the bigger their fan club is likely to be…The Fort Dix bomb plot….A 2009 plot “to engage in violent jihad” in Gaza, Israel, Jordan and Kosovo. Another 2009 attempt by a Brooklyn resident to attack US targets in Afghanistan, Iraq, and the Balkans. September 11th. The organized crime gangs who have taken over heroin distribution along the eastern seaboard. The terrorists who beheaded Daniel Pearl. [A]n increasingly ominous pattern has been visible in the Western media’s Macedonia coverage. What began as a cautious position of neutrality towards the NLA became, by August, downright cheerleading. While in the beginning of the war the NLA had been called “terrorists” by EU security chief Javier Solana, and “murderous thugs” by NATO boss Lord [Robertson], these appellations were quickly forgotten in favor of more romantic names like “ethnic rebels” and “freedom fighters.” The Macedonians, on the other hand, became known as “angry Slavs,” or worse. Amazingly, after each and every outrage against Macedonia…the bombing of Leshok Monastery…and others, each ensuing Macedonian protest was dealt with more and more harshly by the media and Western diplomats. took in over 400,000 Kosovo Albanian refugees. However, when the country was no longer needed for Clinton’s military adventures, it was forgotten, and the long-term consequences of Kosovo — an emboldened pan-Albanian Balkan insurgency — were ignored…[America] began secretly supporting the NLA from its Kosovo base, Camp Bondsteel, through logistical and communications support as well as secret arms airdrops to Albanian-held mountain villages in northwestern Macedonia. For Macedonians, the nadir was reached in June , during a three-day battle at the Skopje-area village of Aracinovo, where NATO ordered the Macedonian Army to stop its operations and then spirited the heavily armed Albanian fighters off to freedom…[T]he public was shocked when it was reported that Islamic fighters and 17 American military contractors from the Virginia-based Military Professional Resources Incorporated (MPRI) had been found amongst the NLA’s ranks. 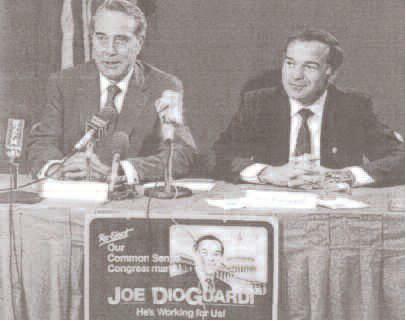 Joseph DioGuardi must be given credit for a sustained campaign to influence Congress beginning in the mid-1970s. 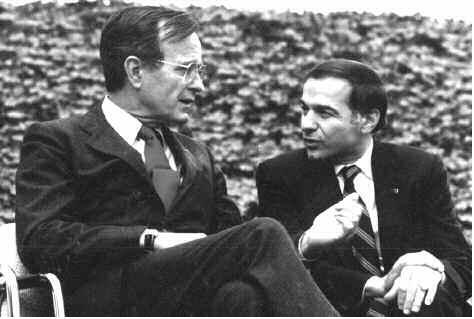 DioGuardi, an Albanian American whose ancestors came from an Albanian transplant community in the heel of Italy, sat in Congress for several years in the mid-1980s as a Conservative Republican from New York’s Westchester County, but creating a Greater Albania was his agenda as a map on his website shows [since removed]. His Political Action Committee (PAC) activities are easy to follow from 1988 on. What makes the PAC and individual contributions to campaigns more interesting is the demonstrated connection between the Kosovo Heroin Mafia, its “pizza connection” distribution (”inherited” from the Gambino crime family) and money-laundering networks, and the number of pizzeria owner-contributors listed in DioGuardi’s filings. The Croats and Albanians came up with big pots of laundered money, then spread it around selectively, with American politicians helping to persuade other members in Congress. 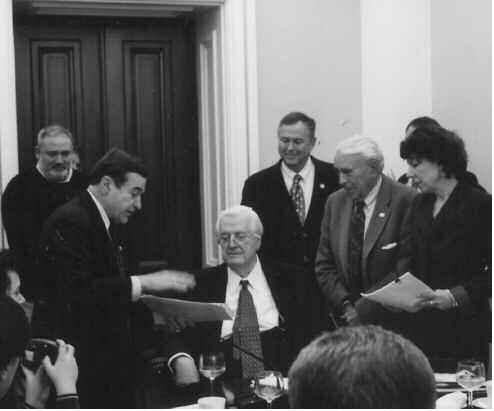 …[F]oreign policy, in a democracy, can be “bought”–that is precisely what happened in the case of the Kosovo Air War…In particular, most of the Congressmen speaking loudest against Serbia and Serbs are those receiving money from DioGuardi’s PAC. Some have simply been beguiled, others may be more disingenuous. Recipients come from both sides of the aisle but are mostly members of the House or Senate foreign relations committees: Joseph Lieberman and Jesse Helms, Benjamin Gillman [sic] and Tom Lantos. [The] records do not reveal monster sums of money, but demonstrate the tip of the iceberg, where “soft money,” individual declared contributions and bags full of $100 bills also find their way to select candidates. While reports have appeared in the Times of London and elsewhere linking members of the Albanian Mafia to the KLA, as Stacy Sullivan demonstrated in her examination of the group in the November 22, 1998, New York Times Magazine, a substantial amount of the KLA’s money comes from the worldwide Albanian diaspora…Indeed, New York is a KLA cash cow. “The KLA keeps getting more money,” says DioGuardi, noting that contributions from New York’s Albanian community have run into the millions. “Albanians work hard, work together, and are good at raising capital,” he adds, noting that recently $385,000 was collected in one night in Dallas. Albanian Mafiosi, meanwhile, were dealing heroin from communities in New York’s Brooklyn and Bronx boroughs, from Boston, Detroit and Chicago. From 1991 Albanian Mafia “crews” were also robbing supermarkets, ATMs and check cashing services in New York and other cities around the nation to raise campaign money and to buy arms for what became the Kosovo Liberation Army. Tropoja was a KLA stronghold, and hailing DioGuardi’s primary victory as “shaking up the Republican Party” was a Wall St. Journal blog post by a businessman named Sahit Muja, “President of Albanian Minerals & BYTYCI SHPK, Tropoje, Albania.” A village along the Kosovo-Albanian border, Tropoja (or Tropoje) was a common staging area for bin Laden’s network and the KLA, as WND’s Joseph Farah revealed in his aforementioned bulletin, citing intelligence documents obtained by The Washington Times in 1999. (The Times also called it “a center for Islamic terrorists.”) The place was identified in 1994 as the Kosovo headquarters of the Albanian drug network by European Commission investigators at the France-based Observatire Geopolitique Des Drogues. One of the four U.S. citizens rounded up in that plot was named Kola Dedvukaj, who along with a relative and co-conspirator named [Rrok] were campaign contributors to Lantos and his daughter. 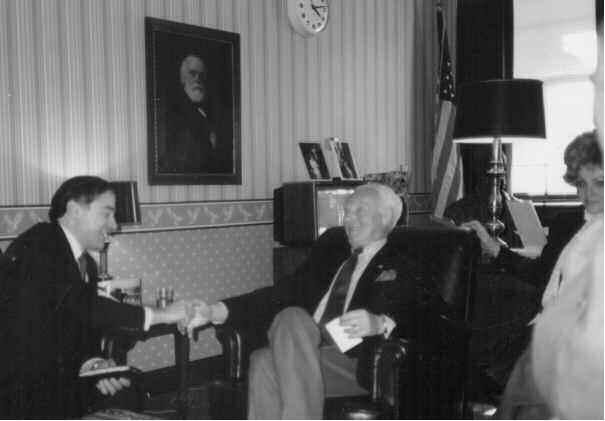 According to Bozinovich, in October 2003 Lantos had organized a hearing to make recommendations to the Bush administration regarding human rights in Montenegro; presenting testimony that Montenegro was made up partly of “annexed Albanian lands” and that Albanians there suffered genocidal discrimination was Lantos’s star witness Kola Dedvukaj. DioGuardi has openly advocated carving out a Greater Albania. The Christian Science Monitor reported in 1998, “The league not only supports the KLA and its goal of independence for Kosovo, but advocates the ‘liberation’ of areas of Macedonia, Montenegro, and Greece…a recipe for a regional cataclysm.” In the early 2000s, DioGuardi’s AACL website still blatantly exhibited “a picture of an idealized ‘Greater Albania,’ incorporating parts of Serbia, Macedonia, Montenegro and Greece,” wrote Caliphate author Deliso. The map has since been removed and today the site sports two eagles — American and Albanian — above the Capitol dome. Obviously, the map was not demonstrating a commitment to “freedom and democracy,” as the Albanian claim has been, but something else altogether. To that end, Shirley Cloyes has been writing about “human rights violations” in southern Serbia’s Presevo (or Presheva) Valley, stoking the Albanian-separatist fires to start a Kosovo-style war there. There, where Serbian — and again “collaborator” Albanian — police are being targeted (including at stations shared by KFOR). Just as it began in Kosovo and Macedonia. (Albanians had tried to seize this “East Kosovo,” as some call it, in 2000 on the heels of the Kosovo conflict, but NATO brokered a peace deal with Belgrade.) Imagine Presevo Valley and Montenegro separatism being put on the Senate’s agenda, as they surely will if DioGuardi is allowed back inside the Capitol Building. Will he again push for ground troops, which reporter Grigg characterized correctly the first time: “The KLA gets U.S. arms to continue its irredentist campaign, and U.S. servicemen get the dubious privilege of dying on behalf of ‘Greater Albania.’” We’re seeing again, what coexistence the Serbs and Albanians have managed there can’t be allowed to stand. As for the “Albanian National Cause” that the non-Muslim DioGuardis trumpet, like so many other national causes it predictably has long since been hijacked by jihad, whose elements were involved from the beginning and whose handiwork can be seen in the 400 mosques that have gone up in Kosovo since 1999, with funding from Saudi Arabia, UAE and Turkey. While 150 churches have been destroyed. 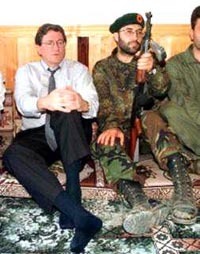 The Wall St. Journal-Europe article “Al Qaeda’s Balkan Links” noted that “Albanian separatism in Kosovo and Metohija was formally characterized as a ‘jihad’ in October 1998 at an annual international Islamic conference in Pakistan.” In his 2006 memoir, then Pakistani president Pervez Musharraf casually referred to “the Kosovo jihad,” and in November 1998 The London Times mentioned a KLA volunteer from Saudi Arabia telling a Dutch interviewer that Kosovo was his “eighth jihad.” Aussie terrorist David Hicks also trained with the KLA. So it doesn’t really matter how we insist on seeing Kosovo, the Islamic world sees it for what it effectively was. But despite being Catholic, DioGuardi is undeterred. Being Albanian for a living has made him a lot of money and besides, almost all Albanians share the same nationalist goals (well, the ones still living do; the others have been done away with). You’ll rarely find one without an Albanian flag either in hand or affixed to his car, clothes, or business. The bigger picture is of course that DioGuardi’s still predominately moderate Muslims (though they weren’t moderate nationalists, an extremism that is easily channeled in new directions) were the long-term target of the radicals who “helped” them in their territorial war against Balkan Christians (and are still helping). Kosovo’s Albanian leaders have sought to reassure the West, and especially Israel, that an independent Kosovo will present no threat of Islamic radicalism. And with the past couple weeks of constant cameras panning over a province awash in American flags, while helpful Western journalists make a point of witnessing Muslim Albanians drinking beer, the average reader might be forgiven for believing them. The reality, however, is more complex…In every case, it only takes a radicalized minority to present a problem. To claim that Kosovo does not have such a population, let alone to deny that it is slowly increasing, is simply whistling in the dark…The establishment of strong cross-border logistical networks, ‘safe houses’ and propaganda channels blossomed after August 1999, when the United Nations began administering Kosovo following NATO’s bombing campaign. At that point, Wahhabi proselytizers from the Arab world descended on Kosovo in force. …American and European police investigators and advisors within Kosovo’s UN administration have noted a slow yet steady increase in the number of committed Islamists being inserted into positions of influence within the Kosovo governmental bureaucracy…Indeed, regardless of what its leaders may say, the Islamist internationale sees a definite opportunity in the new Kosovo. Deliso then asks the ultimate question: How will America compel the world to stand against terrorists when it in fact coaxed the world into sponsoring them — and continues to do so? A case in point is another DioGuardi pal, the U.S.-backed former “prime minister” of Kosovo Ramush Haradinaj, currently being retried at the Hague after some witnesses started dropping dead the first time around and others backed out — resulting in an “insufficient evidence” acquittal. (Upon Haradinaj’s re-incarceration over the summer, DioGuardi’s KLA “veterans” threatened war.) Haradinaj has been an honored guest at AACL events and DioGuardi made an appearance at his friend’s trial in March 2007. 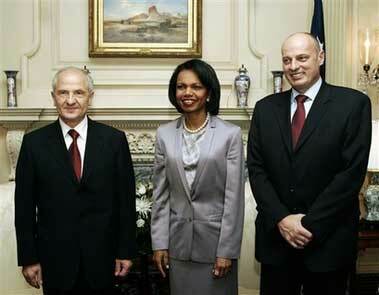 And what was this “leader” in our “multi-ethnic” Kosovo doing during the March 2004 pogroms? By the time the West realizes that Albanian demands will never end, it may be too late. Like spoiled children, the Albanian negotiators will keep complaining that their “rights” are being denied them- and they will have the firepower of the NLA/ANA as leverage. The general trend with Western diplomacy is to avoid embarrassment at all costs, and indeed, to completely deny making any mistakes. In this sense, Macedonia suffers because of Kosovo. Western leaders do not want to admit that supporting the KLA/NLA has been a disaster–because it implies that all of the actions leading up it, including the Kosovo campaign, and the earlier anti-Serbian interventions, were fundamentally flawed. Pulling one thread would indeed unravel the whole cloak; but the emperor does not wish to be seen standing naked. Certainly complicating these otherwise straight-forward accusations is the fact that the US government made the KLA out as ‘pro-American freedom fighters’ and whitewashed their record because of foreign policy considerations at the time. While it is naive to suppose that the US has not embraced terrorists and mobsters for policy considerations before — the wisdom of which we can differ on — that does not mean that terrorists and mobsters are not terrorists and mobsters. Nor does it grant DioGuardi immunity for his ties to them. One doesn’t whitewash his ties just because we made use of them at one point. In WWII the Italian mob facilitated our entry into Italy, but that didn’t make it immune from future scrutiny. Why should DioGuardi’s associations not be of interest? Why are Christine O’Donnell’s high school Wicca dabblings a bigger story than DioGuardi’s connections to the greater Albanian crime syndicate? Which of course begs the next question: With all the Albanian mafia money sloshing around New York and making its way to lawmakers for decades, it would take a great leap of faith to think that it hasn’t been fueling his campaign. But again, no one has bothered to check. Given the bipartisan nature of our lawmakers’ treachery, a Gillibrand win won’t change our policies in the Balkans, as she will no doubt toe the same line the rest do. But we’re talking about electing the very genesis of America’s self-destructive, pro-crime, pro-narcotic, and pro-jihad orientation there, now spanning four presidential administrations. 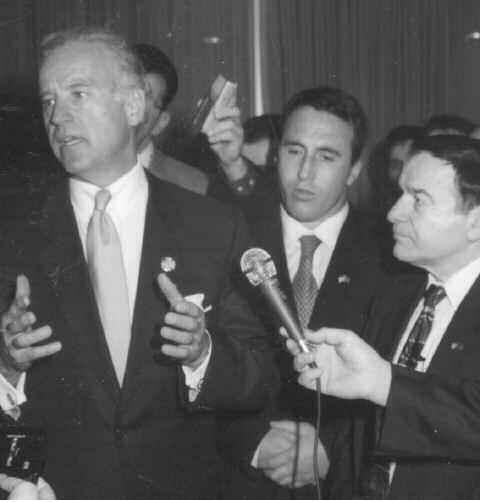 It can all be traced back to Joe DioGuardi, who nonetheless has the gall to run for office. Letting this KLA public relations organ, this terror financier and lobbyist, this gangster back into the Capitol Building where he first started America down a disastrous road will help ensure that ever new tasks at Albanian bidding, will receive greater priority than they otherwise might. And with the KLA’s American godfather in Washington, there’d be even more string-pulling on their behalf, and more protection. Republican New Yorkers essentially would be directly placing the KLA, whose ethnic supremacy has come to guide U.S. foreign policy in the region and has been endangering American lives for more than a decade, into the Capitol. If one can’t bring oneself to vote for a sharia-compliant Democrat instead of DioGuardi, feeling that choosing one over the other is like choosing typhoid fever over a bullet, write in a friend’s name. But anyone who still plans to vote DioGuardi should at least know who and what the man is. Consider that if he does win, at some point his ties are going to come out. How will Republicans look then? It would really be something if conservative New Yorkers, who want politicians to take a stronger stand against the Islamic sprawl, vote in a terrorist like Joe DioGuardi. Indeed, one fears that all he’ll have to do from here is object to the Ground Zero mosque to win favor. As a French anti-jihad activist I met recently put it: “Ah, so ze Repooblicans who are against ze Gwound Zero Mosque voted for a man who helps spread ze terror?” Exactly.